Growing medium -- Worsleya needs a loose, airy medium that drains very rapidly and provides plenty of moisture to the roots. For this reason, ordinary soil does not work. A good base medium is porous rock such as scoria, lava rock, pumice or other volcanic rock, approximately 5 to 10 mm in size. Screen it of any tiny particles or very big pieces. Some organic material may be mixed in to retain extra moisture & nutrients, like fine-grade bark or coco husks. The amount to use depends on the particle size. Coco husks should be no more than 10% of the total volume, fine-grade bark can be 20-30%, and medium grade bark can be 30-50%. Many have reported success using long-fibered sphagnum moss . I have tried it, and it has worked well so far. Choose New Zealand sphagnum moss, as it's the best quality. I recommend mixing in fine bark or porous rock to keep it from compressing over time. This doesn't need to be more than 20-30% of the mix. Transplanting -- Leave your plant in its pot for 2 weeks after receiving it, so it can recover from being shipped. You may give it some filtered sunlight during this time, with protection from strong afternoon sun. After 2 weeks, you may repot it to a pot about 5 inches wide (12 cm) and about 7-8 inches tall (18-20 cm) with drainage holes. Repot gently to avoid disturbing the roots, which are fragile. Keep the bulb exposed, and the roots buried. Give it bright, indirect light the first 2-3 weeks, then expose it to direct sun gradually, protecting it from strong afternoon sun for 2-3 months. Watering -- The roots should always stay moist, which means it will need water about once a day. Water the entire surface, and use enough water so it runs freely out the bottom of the pot. During periods of slower growth, like during cooler temperatures, you may need to reduce the watering frequency. When you go on vacation, you will need to use an automated watering device - unless you can find someone reliable to water it for you! Fertilizer -- Worsleya likes regular, light feedings, since the medium it grows in does not hold on to much nutrients the way soil does. You may either feed with each watering using a very dilute dosage, or feed about once a week using a stronger dose. An alternative is to mix some slow-release, granular fertilizer into the top inch (2.5 cm) of the surface and let it slowly dissolve with each watering. Choose a fertilizer labeled for indoor plants. The disadvantage of granular fertilizer is that the pellets may dissolve slower than they would in soil. 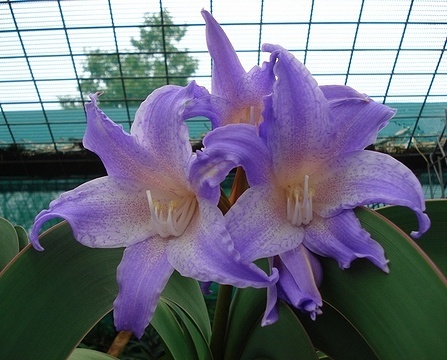 Worsleya can often grow fine with general-purpose fertilizers. Choose one that contains micronutrients (zinc, iron, etc) and calcium & magnesium. Liquid hydroponics fertilizer works well, because it is easily absorbed and doesn't rely on soil microbes to make the nitrogen available. I use General Hydroponics Flora fertilizer , using 1/2 teaspoon per gallon (2.5 mL per Liter) for each bottle. When your plant nears maturity, high nitrogen fertilizers could delay flowering. It's normal for an older leaf to occasionally turn yellow and then brown, but if it seems excessive, the roots may be too dry. If you are sure they have not been moist enough, the plant may need more nitrogen fertilizer. Climate -- Worsleya comes from an area with moderate temperatures and cooler nights, similar to San Diego's climate. Try to protect it from temperatures above 90 degrees F (32°C), or at least give it cooler temperatures at night. In warm conditions, keep the pot shaded, perhaps by placing it inside a larger clay pot. In a warm greenhouse, put it on the floor where it is cooler. Outdoors, it can tolerate a couple degrees of frost, but i recommend keeping it above 35 degrees F (2°C), especially the first 2 years. Over about 40% humidity is preferred. Lighting -- Worsleya likes mostly-sunny conditions, with some protection from strong afternoon sun, especially in warmer conditions. The leaves will naturally arch towards the sun, and should be allowed to stay in this position (don't rotate the pot). After 2-3 years, repot it to a container about 12 inches (30 cm) tall. Avoid repotting again, as this will delay flowering. It does not mind being pot-bound provided that the roots stay moist.